With the release of iOS 7 Final Firmwares for iPhone, iPad & iPod Touch, Apple had also released the much awaited iPhone 5S and iPhone 5C smartphones to general public. iPhone 5S and iPhone 5C both new smartphones are available with iOS 7 Firmwares initially but as soon as users will activate their devices, they will received over-the-air (OTA) update of new iOS 7.0.1 Firmware (Build: 11A470a). Apple has already released the iOS 7.0.1 Firmware Version for iPhone 5S and iPhone 5C devices but if any user don’t want to use OTA update from Settings > General > Software Update options than they can Download and Install iOS 7.0.1 IPSW Firmwares for iPhone 5S & iPhone 5C via Direct Links Manually through iTunes. Currently iOS 7.0.1 Firmware Update is only available for iPhone 5S and iPhone 5C devices and not available for iPhone 5, iPhone 4S, iPhone 4, iPod Touch 5G, iPad 4, iPad 3, iPad 2 and iPad Mini. What's New in iOS 7.0.1 Firmware? 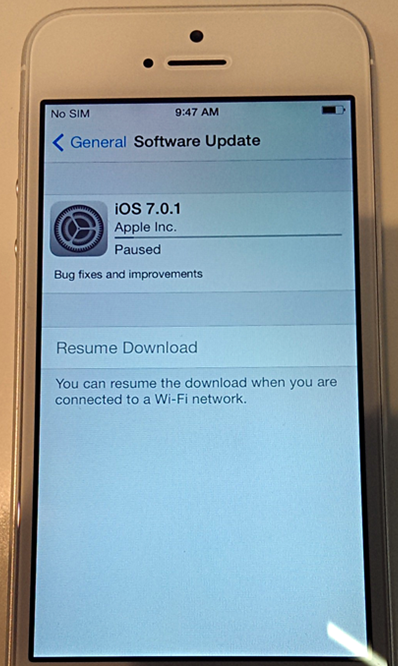 The new Apple iOS 7.0.1 Firmware Update (Build: 11A470a) contains new Bug fixes and Performance improvements on iPhone 5S and iPhone 5C devices i.e. Touch ID Sensor fixes, iTunes App Store purchases system improvements etc.